On 7 February 2002, Yihua Gao and Yoshio Bando of the National Institute for Materials Science in Tsukuba, Japan, announced they had created a thermometer from a single carbon nanotube. Measuring just 75 nanometres wide and with a length of around 10,000 nanometers, the tube contains liquid gallium, whose linear expansion properties allow the measurement of temperature in a wide range from 50-500 Celsius (122-932F). It is hoped that this new use of carbon nanotubes will allow the measurement of temperature in diverse microenvironments. 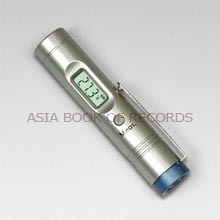 Comments for SMALLEST THERMOMETER are now closed.